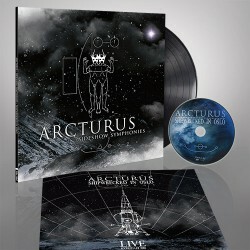 White vinyl + "Shipwrecked" DVD in deluxe gatefold. 4 page insert. First pressing 350 copies. 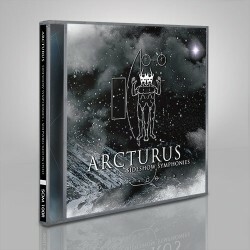 Originally thought of as a black metal super group, ARCTURUS quickly become one of the world's premiere progressive metal bands. The bands fourth album, 2005's 'Sideshow Symphonies', brought change yet again in the form of a decidedly more guitar-heavy approach. Now remastered, and paired with the long out of print 'Shipwrecked in Oslo' DVD (a professionally recorded live show in Sept. 2005), this lp + DVD set showcases the influential band at the height of their powers. 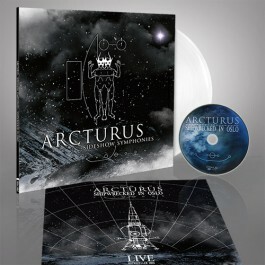 ARCTURUS are renowned for a reason, and this deluxe reissue marries their legendary avant-garde studio magic with the world-class live show that only they can deliver.